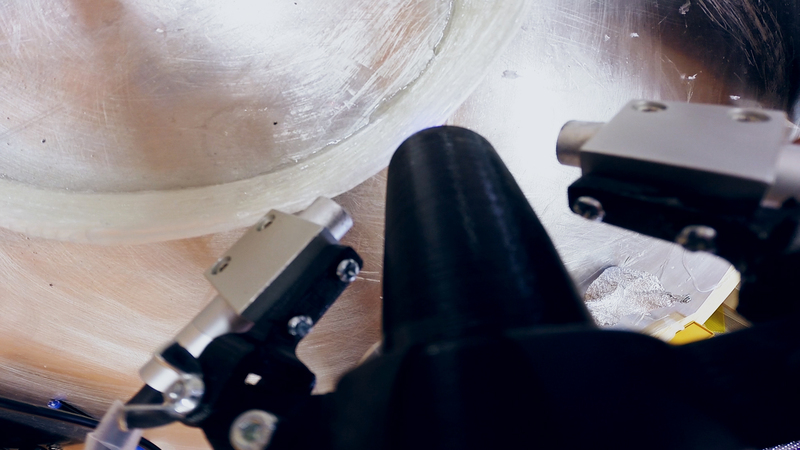 +LAB redefines the composite manufacturing industry with Atropos, a revolutionary robotic arm. Inspired by nature and silkworms, and controlled by the artifact intelligence of special algorithms, Atropos fluently moves in space depositing a continuous fiber of thermosetting composite material, instantly cured as it comes out of his head. 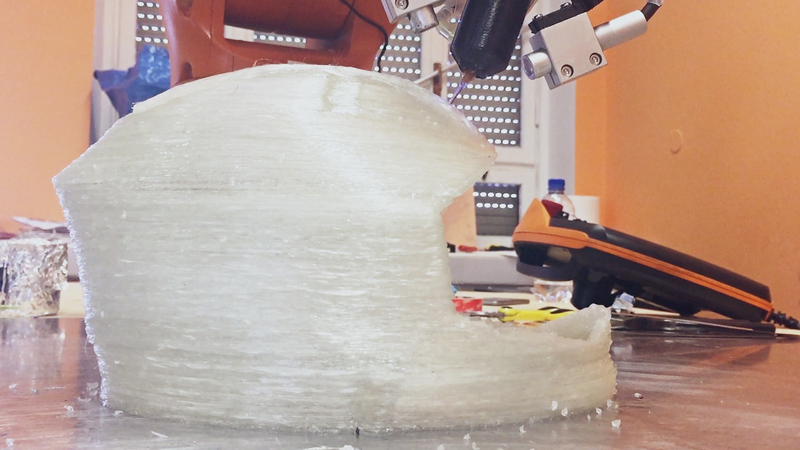 Atropos, in Greek mythology one of the three Moirai, is a new six-axis robotic arm born from the collaboration with KUKA, for the robotic arm, and Owens Corning, for the glass fibers. The revolution of this process lays in not needing molds, combined with the high mechanical performances of composite materials. Producing every object different from the other is now possible, opening to new possibilities in fields where both characteristics are necessary. A new era of manufacturing has born, combining the quality of custom-made product with the performance of technological artisanship. Trying to achieve the best results with the least material is our original idea: Nature offers many examples of this approach, and some of these solutions are based on fibers indeed. Spider silk and silkworms are one of the classical examples, as well as other creations of nature like trees and leaves, as our muscles and tendons are fibrous. By studying the natural behavior of silkworms, the idea of using a six-axis robot came naturally. 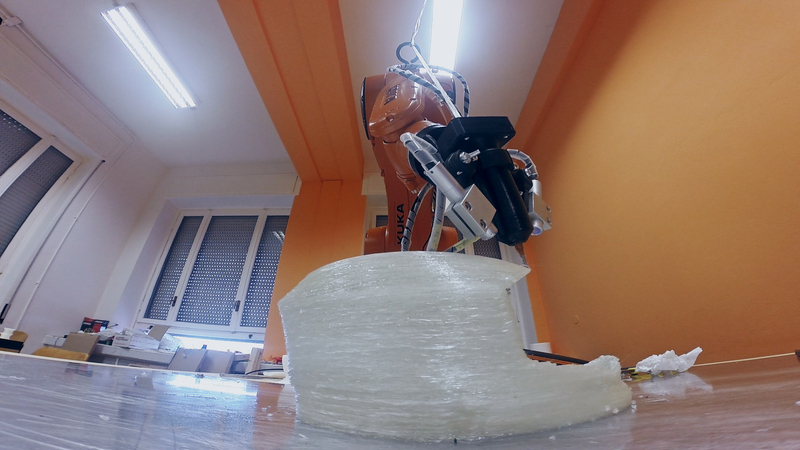 The possibilities of movements allowed by the robot, while maintaining the head free of excessive mechanisms, has been one of the key factors to succeed in this additive manufacturing process. The number of axis allows for movements otherwise impossible, making feasible to deposit the fibers in the direction of stresses, optimizing the performance and the material consumption. Continuous fiber composites have peculiar characteristics that can be exploited to obtain high-performing materials. 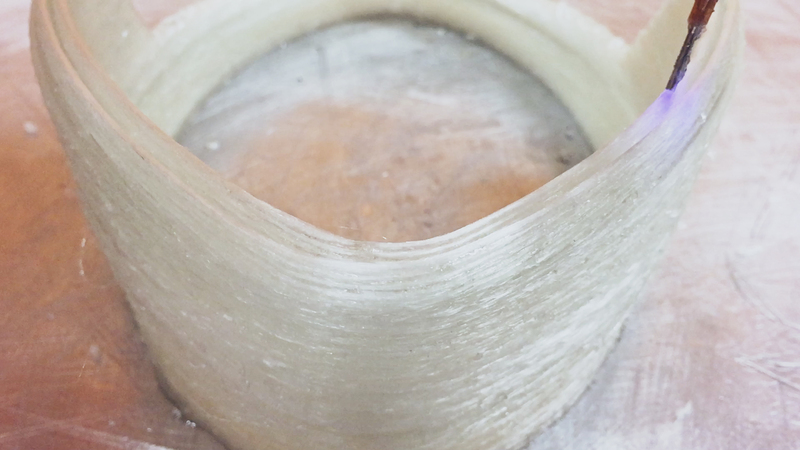 One of the most important features of this class of materials is their intrinsic anisotropy, in fact, fibers have a high elongation stiffness and tensile strength, but they offer lower resistance to compression or to mechanical stresses in the perpendicular direction. Today we are using fibers made of glass and basalt (kindly supplied by Owens Corning and GS4C), embedded in an acrylic photocurable resin. We are also working to expand the usable materials: in particular we want to process fibers made of carbon and polyaramides but also natural fibers such as bamboo. We are also investigating epoxy resins as possible matrices for the composites. There are several prominent manufacturing technologies for the production of composites. 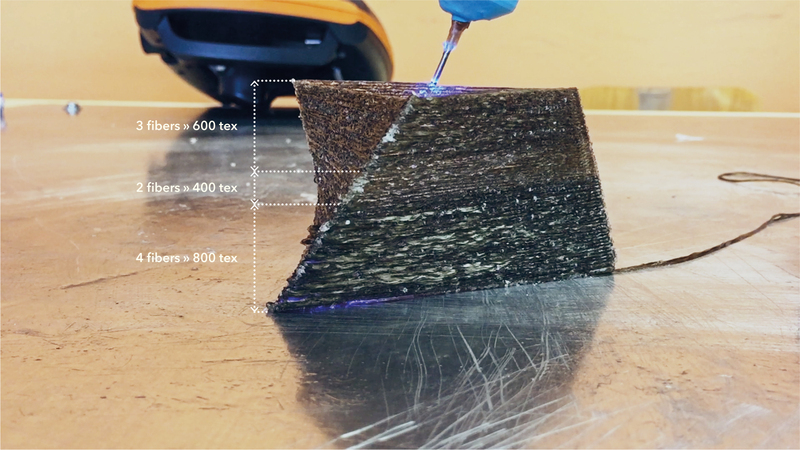 However, the Continuous Fiber Composite Smart Manufacturing we are developing is not comparable with standard techniques, in fact is a new and promising way to obtain unique high performances lightweight products. The objects produced by this process do not need any mold. The item can then be subject to further processes, such as lay-ups, or left as it is, ready to be completed with final additions. The anisotropy of the material is designed pointwise. It is possible to better optimize the internal and external shape of the object, according to the requirements. It is also possible to analyze the object with FEM software, discovering the stress lines and placing the fiber congruently to their direction. The non-linear slicing approach allows the creation of a smart path that build the whole structure with a continuous long fiber, or different ones where required. The process starts from the design of the object inside Rhinoceros, a 3D modeling software, and thanks to the potentiality of the graphical algorithms editor Grasshopper and KUKA|prc, the data for the tool, path, and motion is generated. Following the patented idea from +Lab, fibers are soaked with a special resin by a system of reservoirs and mechanisms carrying them to the printing head. 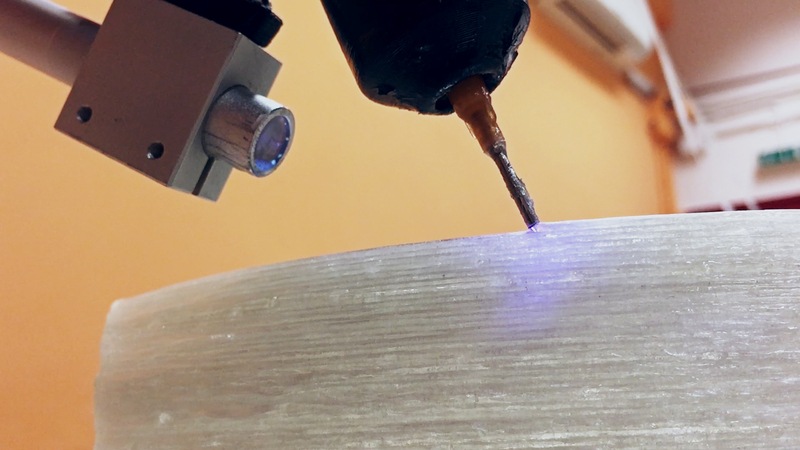 The robot then starts to place the fibers in the space, moving the head towards the designed toolpath, meanwhile, a UV source induces the photocuring of the composite. The rapidity of the polymerization allows printing freeform in space, reducing, or even abandoning, the needing of supports. The process is scalable, in order to obtain extremely precise structure or, on the other hand, to obtain large complex products, similarly to the automated fiber placement process, without the bounds of a mold and or any service structure. The process is always in evolution. Every day we are adding new features enriching the process, in order for it to become more stable and higher performing. 21 days ago we were able to only print glass fiber with a maximum speed of 5 mm/s. 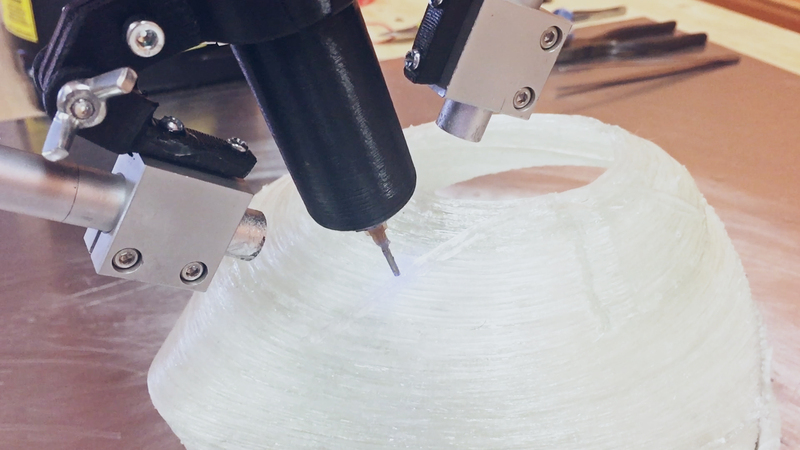 Today, we’ve improved the speed by 400% and we have now the ability to print other materials such as basalt. 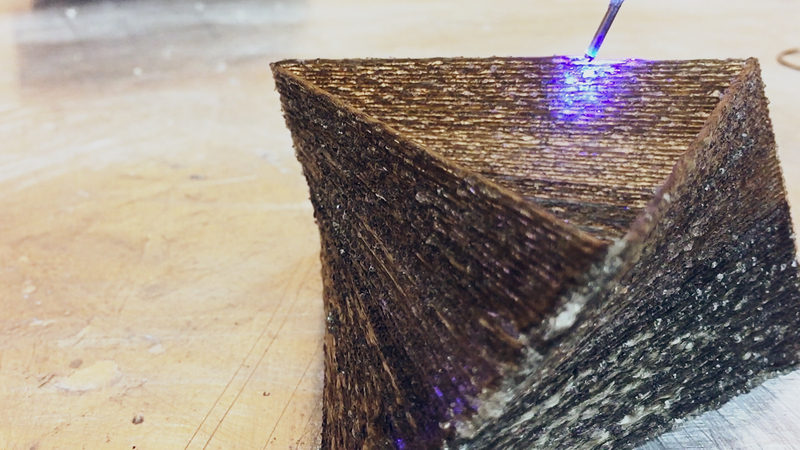 We are currently designing new mechanisms and chemical formulations in order to improve the printing speed and the range of materials able to be printed, such as Carbon fiber and Kevlar, as well as upgrading the reliability of the system.